Description: The Sabik are short and covered in thick brown fur. They look like eight year old Humans wearing dog costumes. 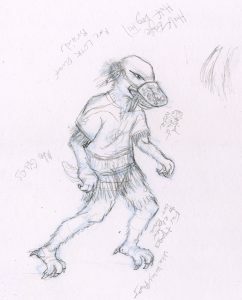 They have massive feet shaped like the claws of birds, which they use to climb trees and rocks. They have long tails covered with fur that look a little like feathers. Over their noses they wear small wooden helmets with decorative carvings all over. They’re held on by braids of hair from behind their ears. 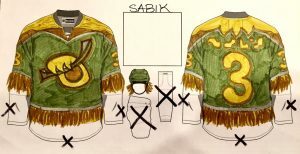 Sabik jerseys are short, only coming down to the top of their furry bellies. Culture: They come from a very cold and windy planet that’s completely covered by dangerous forests and massive mountains. They are very tough, just like their planet. They are a very proud and noble species, who are feared throughout the universe as fierce warriors. The Sabik have a strict code of honor, and refuse any special rules or equipment. Scouting Report: The Sabik don’t need skates, since they run and change direction better using their claws. This also tears up the ice, making it harder for opponents to skate and pass cleanly. When going up against the Sabik, you should be ready for a tough, physical contest. They are excellent checkers and one of the strongest species in the universe. They’ll never give up on a puck and will never play anything less than their very best. Fun Fact: The names and numbers on Sabik jerseys are made from a special wood. The miniature trees where it comes from is sacred to the Sabik. They only grow in a tiny forest at the top of the tallest mountain in Kibashim.^mik.